Languages: English, Burmese. English subtitles. "Mrs. Cold Snow feeds a Thousand"
Setti Wessels (born 1962, South-Africa) is an artist/architect practicing meditation and yoga. She traveled to Myanmar in 2010 where she meditated for six weeks. This experience was so impressive that she decided to return to make a documentary so that the rest of our western world can be introduced to these extra-ordinary 2,600 year old Buddhist meditation techniques. In 2012 Setti returned to ordain as a nun for four months, and to complete the editing of the documentary. There is now not only one, but two documentaries. Setti made the documentaries independently on a "less-than-shoestring" budget, using a Canon 5D markII camera and a macro lens and extension tubes for extreme close-ups. She made the films on her own while meditating. Film, sound, editing, scripts and interviews grew organically into a documentary that gives insight into the deeper meaning of ancient Buddhist texts as practised in Myanmar. Animations were made in collaboration with the local meditators and teacher, using beautiful original watercolor paintings based on actual meditation experiences to explain complex techniques. They all agreed. The drawings and animations mirrored a true and universal experience that was recognisable - and that matched their own... The film is based on actual experiences, not imagination. In Amsterdam the editing was completed in July with the assistance of Anna Gulevich from Maakriun3, to streamline the complex story for the western viewer. 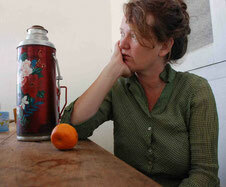 Setti Wessels (geboren 1962, Zuid-Afrika) is kunstenares/architecte. Zij reisde in 2010 naar Birma waar zij anderhalve maand mediteerde. Deze ervaring was zo bijzonder dat zij besloot deze vast te leggen in een documentaire opdat ook de rest van de wereld kennis kan maken met deze opzienbarende 2,600 jaar oude Boeddhistische meditatietechnieken. In 2012 keerde Setti terug om vier maanden toe te treden in een klooster en haar documentaire af te monteren. Er kwamen niet één maar twee documentaires. Setti maakte haar documentaires alleen, met behulp van een Canon 5D MarkII camera en macro lens. Zij monteerde al het materiaal zelf en voorzag ze van door haar gemaakte beeldschone animaties op basis van aquarel tekeningen.